Romain Jerome treats its already legendary Titanic-DNA collection to a new more generously sized case featuring no less than 50 mm of steel, black PVD-coated steel or 5N rose gold depending on the variation, and topped by an oxidised bezel entirely riveted with hand-applied parts. 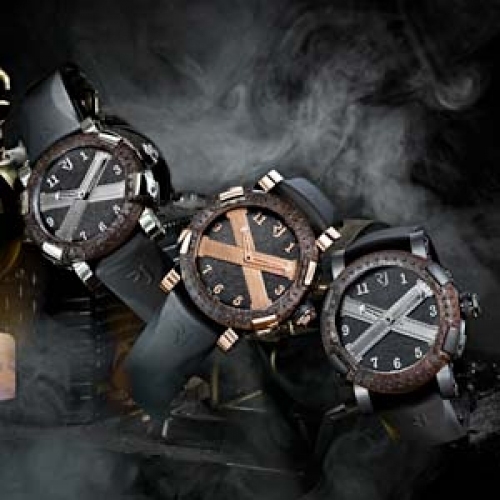 Nonetheless, the expert workmanship of the Romain Jerome craftsmen does not stop there. Inspired by the hull and the boiler room of the famous ocean liner, they have meticulously used 80 rivets to craft the iconic transversal cross coated with a layer of the noble rust cherished by those with a nostalgic interest in one of the most fascinating legends of our era. Limited edition of 2,012 watches.